The United States Congress designated the Buckhorn Wilderness (map) in 1984 and it now has a total of 44,270 acres. All of this wilderness is located in Washington and is managed by the Forest Service. 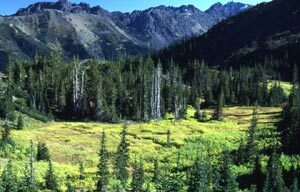 The Buckhorn Wilderness is bordered by the Daniel J. Evans Wilderness to the west and The Brothers Wilderness to the south. Located in the northeast corner of Olympic National Forest, just to the north of The Brothers Wilderness, Buckhorn Wilderness stands divided into northern and southern portions by the Dungeness River and a parallel road. The smaller northern portion, drained by the Gray Wolf River and its tributaries, descends from higher mountainous terrain to lowlands heavily forested in fir, hemlock, and cedar with an understory of moss, ferns, and berry bushes. South of the river and south of the trails, the terrain soars skyward to a ragged ridge with difficult access and few human visitors. Drained by the Dungeness and Quilcene Rivers down glacier-carved valleys and fed by deep canyon tributaries, the larger southern portion is even more rugged than the northern. A dense and stately forest covers the lower elevations, while the higher country often opens into large alpine meadows rich with summer grasses and bright wildflowers. Access is provided by 60 miles of trails. Planning to Visit the Buckhorn Wilderness? How to follow the seven standard Leave No Trace principles differs in different parts of the country (desert vs. Rocky Mountains). Click on any of the principles listed below to learn more about how they apply in the Buckhorn Wilderness.